These waffles don’t have the slightly off metallic flavor of chemically leavened baked goods. A chocolate chip cookie has so many strong flavors that it is hardly noticeable. But waffles are really so simple, even subtle, that those off-flavors make it through. Leavening with yeast not only eliminates the chemical flavor, but has the advantage of all the yummy flavor flavor compounds the are the result of fermentation. These waffles have a deep, dark red-brown-gold color, that just puts the pale gold of a regular waffle to shame. 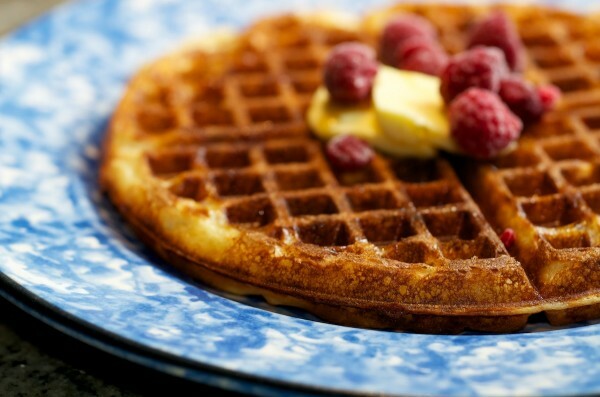 Regular waffle batter is mostly starch, and cooks up pale yellow-gold. But these waffles ferment over night, giving yeast time to break down the flour-starch in into various sugar compounds. The naturally occurring amylase in flour also contributes to this process. The deeper darker color comes from the caramelization of all the sugar-compounds, and as we all know, caramelized sugars taste good. So these waffles don’t just look better, they taste better. As an aside, all your yeasted goods from pizza dough to bread will taste better and have a darker red-brown color if you ferment them overnight or longer. These waffles have a lovely slight sourness that comes from the sourdough starter, specifically the lactic acid secreted by the lactobacilli in the culture. It tastes nice. These waffles have a lighter, airier texture than most waffles. Hell if I know why. It’s like a transformer. But instead of changing from a car into a robot, it changes from white batter into the prettiest, delicate-crunchy-creamy red-brown waffle you’ve ever had. Just like a transformer? Gently melt the butter in a saucepan. Add milk, and gently heat until it is slightly warm, just above room temperature. Whisk in remaining wet ingredients, including sourdough starter. Whisk together dry ingredients. Pour wet ingredients into dry, then mix until combined. Cover bowl, and let rest on counter for 2-3 hours. This will give the sourdough culture time to get going. Put into refrigerator overnight. At least an hour before cooking, move to counter to let the temperature of the batter come up. The batter will be extremely thick and be riddled with air pockets. Give the batter the barest bit of mixing to get rid of the hugest air bubbles, but don’t overmix! Two or three strokes should do it. Preheat a waffle iron, and cook according to the instructions that came with your iron. One note: these waffles turn out waaay darker than regular waffles. If you take them out when they are golden brown, as you do with regular waffles, they will be undercooked. This was written by cedar. Posted on Thursday, May 9, 2013, at 9:43 am. Filed under Recipes. Tagged A++, breakfast, fermented, grains, science!, weird. Bookmark the permalink. Follow comments here with the RSS feed. Post a comment or leave a trackback. These sound delicious! Too bad I don’t have a waffle iron. . . I already have a sourdough starter and I love the breads that I’ve made with them, just the right tangy flavour in them. I’d glossed over this recipe when seeing it in Cooks but gave it a whirl. Tasty. Sort of half way between a regular waffle and a liege waffle (without the effort heavy process of the latter). Justin, pleased that you liked them. Did you use Cook’s commercial yeast version, or my wild-yeast version? How long will this batter stay good in the refrigerator?? I have made this several time with my own wild yeast. It’s really fantastic. Waffles are so light and crispy with that gentle sourdough taste. Thank you.